Minimize 1 password after copy the password is verry nice but i dont find the option. Hey, @brian5542! It's still early in the 1Password 7 beta, so there are more cool things yet to come. Minimizing on copy is likely to be in the more distant future, though. You can quickly copy items from mini by right clicking the item and clicking the copy icon next to the username or password menus in 1Password 7. Mini will get out of your way and remember the item you just used when you next open it making it a better choice for copying than the main app. As for the password generator, the decision was made a while back to simplify it by limiting some of these options. This actually increases the randomness of your password since setting the number of digits and symbols limits the number of possible outcomes. That may change down the road, but we have no specific plans to do so now. 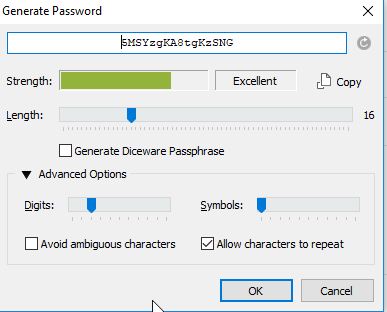 A sufficiently long password generated using the current password generator in 1Password 7 will meet the requirements of the majority of sites and you can manually edit the password before copying it on the rare occasion it doesn't. i hope the old options and the new options come early on the new 1Password 7. Thanks for your feedback, and participating in the beta! thank you you to and all team. I have begin use 1 password with my Mac 2009 - 2010 i think. I ave buy the license for the mac and Iphone. I start 2017 with windows. I dont use my Mac now. Only Windows 10 with Office 365. I want buy the license for 1password 7 for windows, after the beta. On behalf of myself, Kate, and the rest of us here at AgileBits, you're welcome, but more importantly thanks for your support over the years. Have a great weekend! @bundtkate I need to generate bank PINs that only accept digit. How can I do this without the options in the first post? Is this feature ever coming back to 7? Otherwise thank goodness I used a trial before putting my family onto the 1Password service -- I might roll back to iP4 because of this alone..
@liakyh: It seems like an odd choice, to "roll back" for something you really only need to do once, but you're certainly free to do that. I'm really missing these options as well. There are specific Government sites that I log into for work that require specific amounts of letters, numbers, and special characters to be present. Additionally, these sites require the passwords to be changed ever 60 days, so I'm using this a lot. If we have to manage that manually now, that kind of defeats the purpose of the password generator...I could just randomly hit my keyboard a bunch of times for the same effect. Please reconsider bringing these options back. Specific amounts of digits/symbols is very uncommon, and doing that has a negative impact on the strength of the password due to decreased entropy, but we'll continue to evaluate things with feedback from all 1Password users. Thanks for letting us know more about your situation! All I can say is that it's extremely commonplace in the private sector, for better or worse. Thanks for the consideration. Likewise, it's definitely helpful to have that context.